Following Estonia and Latvia, we now come to the third and last of the Baltic States. The centų is the subunit of the Lithuanian litas. As with many European currencies the litas was supposed to have been replaced by the euro in an earlier state, but since the economic crisis has severely damaged the union this has been moved to the future. Now the litas is set to be repaced in 2014. 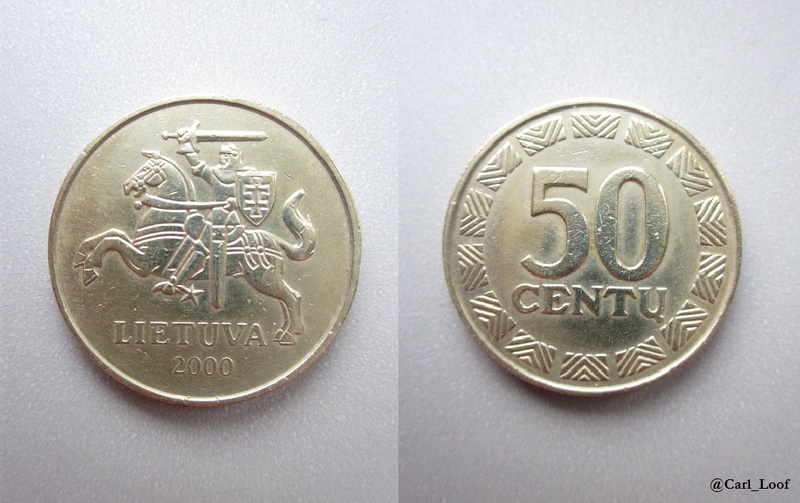 The mounted horseman on the coin is from the Lithuanian coat of arms. This is the symbol used on all coins and have been used in Lithuania and the area since the 14th century. The identity of the horseman is unknown, though there seems to be a couple of theories. I would put my money on him being some sort of nobility of high importance from an early age. The cross on the knights shield is known as the Cross of Jagiellons in Lithuania and has been used by officials in Lithuania since the country was first Christianized. This also happened in the 14th century. Very interesting coin and history behind its design. And I also heard about the Nobel Prize thing. Seems to me they’re using the prize as a political tool to pressure the eurozone to stay together, but who knows. I can see the EU as a peace project in an initial state. I would have understood the prize better if it was given to the EU a couple of decades ago, but today the economic situation and the EU organization is not bringing the countries together, but instead pushing them away from each other. Countries like Hungary and Greece is driven towards political extremism and without substantial reactions from the other member states. The failed economic system has fed right winged extremists all over Europe making them present in almost all national parliaments. The EU is currently in a situation that is not particularly different from the situation the 1920s and 1930s. The Nobel Peace Prize is appointed in Norway – a country traditionally skeptical of the EU. They’re not members and they have no plans to apply for membership. The decision is clearly very confusing.